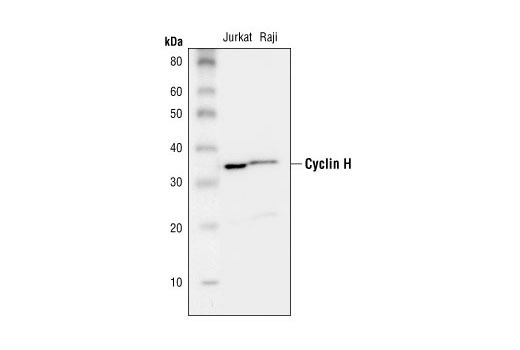 Western blot analysis of extracts from Jurkat and Raji cells, using Cyclin H Antibody. Cyclin H Antibody detects endogenous levels of cyclin H. It does not cross-react with other family members at physiological levels. Polyclonal antibodies are produced by immunizing animals with a synthetic peptide corresponding to residues near the carboxy-terminus of cyclin H. Antibodies are purified by protein A and peptide affinity chromatography. Cyclin H belongs to a conserved cyclin family that plays a critical role in the regulation of cell cycle dependent kinases (CDKs) necessary for cell cycle progression (1,2). In general, the activity of CDKs requires the binding of appropriate cyclins as well as phosphorylation driven by Cdk-activating kinase (CAK). Cyclin H is part of the CAK complex that includes the kinase CDK7, and an assembly factor p36/Mat1, which enhances binding between cyclin H and CDK7 and increases activity (3,4). CAK regulates progression through the cell cycle by activating cdc2, CDK2, and CDK4 kinases through phosphorylation of a critical threonine residue in the T-loop of the CDK-cyclin complexes (5,6). The CAK complex can exist either in its free form or in association with transcription factor IIH (TFIIH) which can affect its substrate specificity (7,8,9). When bound to TFIIH, CAK preferentially phosphorylates the carboxy-terminal domain of RNA polymerase II (9), providing a link between cell cycle control, transcriptional regulation, and DNA repair. Fisher, R.P. and Morgan, D.O. (1994) Cell 78, 713-24. Mäkelä, T.P. et al. (1994) Nature 371, 254-7. Yee, A. et al. (1995) Cancer Res 55, 6058-62. Devault, A. et al. (1995) EMBO J 14, 5027-36. Solomon, M.J. (1994) Trends Biochem Sci 19, 496-500. Shiekhattar, R. et al. (1995) Nature 374, 283-7. Serizawa, H. et al. (1995) Nature 374, 280-2.